Connecticut Gov. Dannel P. Malloy pens strong letter of support for the establishment of New Haven—Springfield—Boston passenger service on the Inland Route. In his letter, Malloy asks that Gov. Baker advance the necessary planning and engineering work that would be required to establish the service. He also asks for the project to be added to the updated Massachusetts State Rail Plan, which is current being prepared by MassDOT. Gov. Malloy’s letter follows a letter of support — for both expanded service on the Knowledge Corridor and East-West rail — sent by Congressman Jim McGovern and Congressman Richard Neal back in November 2016. In a related development, the Worcester City Council on Tuesday evening called for a regional transportation summit to look at improved passenger rail service from Worcester to Boston, and to Springfield, eastern Connecticut, and New York City. 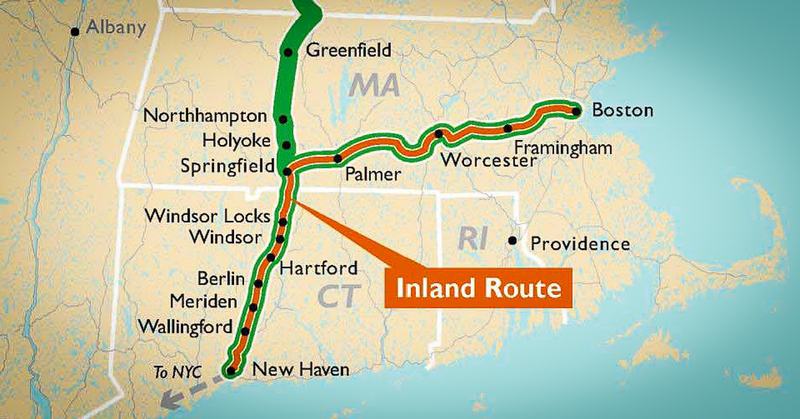 Returning passenger service on the route between Boston and New Haven via Springfield, a service that was recommended in the recently completed Northern New England Intercity Rail Initiative (NNEIRI) study, is not a small project. Moving this project forward requires the support of Gov. Baker, who until now has been reluctant to say much of anything on this topic. Additionally, state and federal funding for the required planning and engineering work would need to be identified and secured. On this page, you will now find links to the 4Q2016 and FY2016 financial reports for Trains in the Valley. This new page is a place where we will maintain a listing of resources that are only indirectly related to the primary topic of this website. As example, this page now includes a link to a nice chart (prepared by MassBudget) that shows the funding sources for transportation in Massachussets and where the funds go. This new page contains a listing of bills filed in the Massachusetts General Court (the legislature) that affect passenger and/or freight rail service in our region of the state. This page has been updated with further information (and images) about the newly expanded short-term parking lot at the Olver Transit Center and the planned new parking garage. The On-time Performance & Departure Delay spreadsheet for the Vermonter has been updated with data through to the end of January 2017. The OT performance of the southbound Vermonter continues to be a problem. And last but not least, we are very pleased to announce that Rebecca Townsend has joined Trains in the Valley. Rebecca is a communication professor who has studied transportation and public engagement, for which the White House named her a “Champion of Change for Transportation Innovation” in 2012. The International Association of Public Participation lauded her work with students to increase engagement in transportation planning, and her scholarship earned her the inaugural State of Connecticut Scholarly Excellence Award. Originally from Rhode Island, she saw how greater access to rail can improve economic activity. She founded the Pioneer Valley Advocates for Commuter Rail (2006-2010) with fellow residents of the Greater Springfield region to garner support for rail in our region of Massachusetts. Get Trains in the Valley’s latest articles straight to your inbox.